Movie Pulse – A cutting-edge companion of your cinema visits. A cutting-edge companion of your cinema visits. You are probably here, because you recently found Movie Pulse at the web, Facebook or at the iTunes App Store. Hopefully, you are a cinephile person. This is 50% of what’s needed to have fun with this app. The other 50%: you are using iOS and (this is the main obstacle) you must own or have access to an Apple Watch. Sorry, please stop complaining. I tell you why. I am a single person, a designer obsessed by movies. And I teach students the use, burden and cool things about media. One topic is film analysis. It’s about the act of learning what do we see, how do we see, read or feel it. And how great masters of cinema history make us become part of the story, make us being immersed. In short, I developed this app Movie Pulse myself to visualize emotional reactions while watching a movie (preferably at a movie theatre). 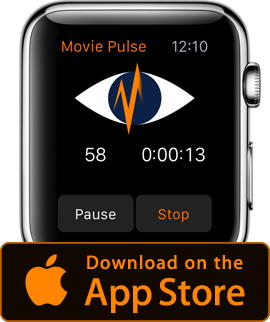 The iOS app Movie Pulse records your heart rate while you are watching a movie at the cinema. A psychologist and me, we examined recordings of sessions we had conducted with our students. The analysis will still take a while, but you can read about the intermediate results here. I am interested to see your results, those of the cinephile or movie obsessed users and want to see looooooooots of graphs of any genre. So people can compare and discuss the differences and similarities by themselves. This is the reason I no longer charge for this app. It is available for free at the Apple App Store. Enjoy. Movie Pulse is the only film tool offering you a timeline with your emotional reactions! Your physiological body reactions are the most objective sources. you can even post them on Movie Pulse Facebook page yourself. Feel free to place your recorded graphs anywhere on the internet, just mention the app. So others have the chance to use the app for their personal analysis. What is the intention of Movie Pulse? The movie which started everything. And something really important, the oldest research relation I could find. A bug report is available, just in case. May the pulse be with you. What a cast! What tension! The movie has been a true roller coaster to my physiological reactions – see the heart rate graph below. Although Stefano Sollima‘s intention on this thriller could be falsely interpreted as a blueprint of Trumpism, I definitely tend to focus on the fine balance portraying gangsters and government people, both lacking moral and ethics. Sicario 2: Soldado has a slender structure and straightforward plot, but this elevates the film. Josh Brolin‘s soldier is the incarnation of the requested person: he simply is the men for the moment when things are about to get dirty. We’ve seen plenty of those soldiers trapped by military authority in various movies, but this is Josh Brolin. The intensity between Benicio del Toro‘s character and the gangster’s daughter is so precise and unostentatious. This works so well in contrast with those scenes with big action and brutality. There is no such thing as surgical warfare, especially when driven by doubtful politicians and based on assumptions rather than facts. You can read a full positive review of Peter Bradshaw at “The Guardian” or a skeptical one of Paul Simon at “Die Zeit” (German). The cutting-edge companion of your emotionally moving cinema visits has become a (minor) update. I fixed some layout issues of larger devices and made the app working properly with the iPhone X.
Analyze your cinema emotions! The app is free of charge! The Greatest Showman · Watched by G.R. I haven’t seen the movie by myself – not yet. But the Movie Pulse of G.R. from Brazil [Thank’s!] and the biography of P.T. Barnum makes me really, really curious. The main character is played by Hugh Jackman, which is another valid reason to see the movie. According to the Movie Pulse below, it seems to be a proper roller coaster of a story. G.R. reported some chills – you can see them in the graph, but you better find out yourself. You are always welcome to share your Movie Pulse, btw.! The movie is directed by Michael Gracey, a former visual effects supervisor. If you like to read something beforehand, I can recommend a review by Sheila O’Malley from rogerebert.com and a German article about the biography of P.T. Barnum. This person seems to be the incarnation of fake, probably Trump is the reincarnation of him. P.T. Barnum biography seems to be a cinematic roller coaster · Movie Pulse by G.R. Movie Pulse will be presented with a short pitch at the Propellor FilmTech #5 “BioFeedback/Measuring and Interpretation of Emotions”. Main speakers include Nikos Green, CEO and Founder, Affective Signals · Jens-Uwe Garbas, Group Manager Intelligent Systems, Fraunhofer Institute for Integrated Circuits and Dr. André Weinreich, CEO of Emolyzr. 4th of December 2017 · 7 PM at Kultur Projekte, Klosterstraße 68, 10179 Berlin. Blade Runner 2049 · Watched by A.S.
A.S.: Two of my friends and me decided to watch “Blade Runner” and “Blade Runner 2049” in a row. We watched the original “Blade Runner” first, to be prepared for the sequel. It’s been 4 or 5 years ago that I watched Ridley Scott’s movie from 1982 the last time. After that, we went to the cinema for “Blade Runner 2049” directed by Denis Villeneuve. It’s now in the 4th week and the cinema was empty. But that was fine for us. After 164 Min I was totally stoked. For me personally, “Terminator 2” is the best sequel of all time. But “Blade Runner 2049” is close behind. The story is intense, very well narrated and a huge evolution. All the essential parts of “Blade Runner” have had a motivated continuation in the movie of 2017. I really like to see actors from the first movie appearing in the sequel, not just for „fame“. Rick Deckard aka Harrison Ford is an important character for the story of “Blade Runner 2049”. It felt really logical and natural as he showed up. But it’s not just the story. The VFX, the sound design, the characters, the set design etc. – everything is stunning! Maybe the runtime is a little but too much. I think if you’re not into the “Blade Runner” topic the movie could be lengthy. But if you are, all the others aspects conceal it in an awesome manner. Thank you for sharing, A.S.! This review of Mark Kermode (The Guardian) is worth reading as well, because he has been sensitive not only to the visual achievements – he describes in detail the soundscape of Benjamin Wallfisch and Hans Zimmer. “Blade Runner 2049” of 2017 · watched by A.S. The overall waveform is different, but there are similarities in particular regions (red/green before 0:30 and around 1 hour) and watch out for identical peaks at 1:35 | 2:11 | 2:32 and some close ones. Terminator 2 in 3D · Watched by A.S.
A.S. : Terminator 2 is one of my absolute favorite movies. I’ve seen it several times in my life, but I haven’t seen it at the time of its release in 1991 (I was 6 years old). Because I couldn’t see it at the cinema, it was necessary to watch it now. The 2017 version is digitally remastered in 3D. I don’t really like the 3D technology but James Cameron invested 8 million dollars for the stereo conversion and the result is absolutely fantastic. The picture is crisp (not like the usual blurry 3D movies) and offers plenty of (reasonable) depth. Cameron had already worked with a lot of depth of field in the original movie, this is one reason the 3D version felt so intense. The movie is nowadays still thrilling, emotional and fantastic. The best sequel of all time. I guess my pulse curve is speaking for itself. Terminator 2 3D (2017) · watched by A.S.
We find the Roger Ebert review is worth reading too. The timeline offers a dramatic change, which really depicts the excitement the user had have at the beginning. Although the pulse decreases dramatically in the long run, it stabilizes after 1/2 h, followed by a very good development afterwards. A very high, long and spectacular peak around 1 hour and a nice intermittent performance up- and downwards in the 2nd half of the movie triggered the user. A correlation of the users heart rate and his not fulfilled expectations can probably be found in the overall decreasing moving average. Again it would be so interesting to compare this single result with other records. How can we improve Movie Pulse? Almost off for summer vacation, we’d like to leave this survey [completed] for those of you interested in Movie Pulse. We love to hear how we can improve the app. We’ve outlined several ideas for additional features in the survey and we are really curious what do you think. No matter if you are new to Movie Pulse or if you are a regular “recorder”. So, come on: spend less than 5 minutes. Help improving Movie Pulse answering some questions. Accompanied by Dr. André Weinreich, Head of Research & Science from emolyzr/Humboldt University, I’ve run several sessions during the winter semester 2016/17. We now have a gathered some data for the movies which had have enough attendees. The numerical data provides two main starting points: either analysing the questionaire or the plain heart rate data. We check several options to find some correlations between them. The first obvious result is the relation of mean heart rate and liking. At present we focus on cluster analyses from both “ends”: the average rating as well as the individual pulse. These are the mean heart rates of each screened movie in alphabetical order. In this earlier post some reasons are given, why these films were chosen. Most movies have been screened in a lecture hall, some at a regular cinema, which clearly caused immersiveness at different levels. Can an overall trend be identified in individual sections or the entire film? The analysis’ goal is to find some structure in observing the heart rate of movie goers. One outcome might be the relation between the heart rate and the likness. Because we are still in the process of applying different approaches, we are not yet ready to publish the whole data. If you are interested to get more details of this movie analysis study, it’s progress in analysis, or how Movie Pulse can be used for analyzing any feature length movie yourself, get in touch.